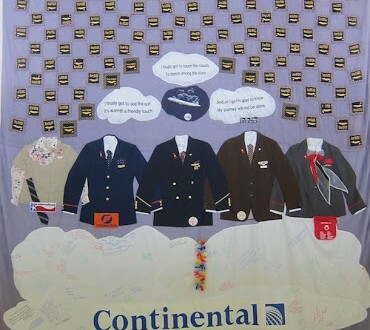 WASHINGTON: Continental Staffers Honored At Dulles AIDS Quilt Display - Joe.My.God. The travel blog Jaunted was moved to tears. Ever just started crying in an airport? Until this week, we’d have answered “no”—and even this week, it wasn’t anything to do with our flight. No, it was the sheer power of the blocks of the AIDS Memorial Quilt currently on display at Washington Dulles, and in particular this block, “Sewn with love by the flight attendants of Continental Airlines.” Over a hundred men (and, potentially, women, though we didn’t spot any specifically female names) from Continental and its predecessor airlines—Texas International, Frontier, PEOPLExpress, and New York Air—are memorialised in this one block. More poignant still: the square appliqués with every name are all bordered with the material from the ties of each airline, with the five uniforms, pins, buttons and memorabilia also appliquéd between the clouds below. And a rainbow lei down the bottom. We simply can’t imagine the time, love and remembrance that the flight attendants of Continental—now, of course, United—put into this Quilt block. RELATED: As part of the Smithsonian’s Folklife Festival, the AIDS Memorial Quilt will be on display on the National Mall and at over 50 other DC locations for five days beginning this Saturday.